Do you think sanding wood is a dull, dusty, tiresome chore? Well, you’re not alone. Most people would rather submit to a root canal than to sand wood. But that attitude has begun to change since the advent of the random-orbit sander, a portable power tool that makes sanding faster, cleaner and much less tedious than ever before. The first electric random-orbit sander was introduced in the early-1980s, but it took another decade or so before it became regarded—as it is today—as the most versatile and indispensable of all portable power sanders. Filling the void between a belt sander and an orbital finishing sander, the random-orbit sander can handle virtually any wood-sanding task from heavy stock removal to ultra-smooth sanding of fine finishes. Now, it’s easy to confuse a random-orbit sander with an orbital sander. First, the two names sound alike, but they also share a common design: both have compact housings with rounded palm-grip tops. However, there’s one small, but very important distinction between the two tools: an orbital sander has a square sanding pad, and a random-orbit sander has a round pad, and that one variation makes all the difference. 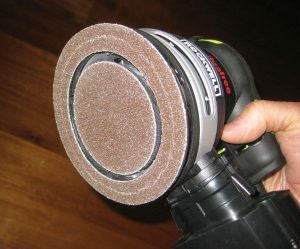 The round pad on a random-orbit sander moves in “random orbits,” meaning it vibrates in tiny circles, like an orbital finishing sander, but it also spins in circles. As a result, random-orbit sanders are much more versatile and can handle both aggressive and delicate sanding jobs. And because the pad vibrates and spins simultaneously, it virtually eliminates swirl marks that are often left behind by orbital sanders. Swirl-free surfaces are especially important when sanding hardwoods and veneers that will receive a clear topcoat finish. The most popular random-orbit sanders have 5-in.-dia. sanding pads, though 6-in. sanders are available, as well. Some models accept peel-and-stick pressure sensitive adhesive (PSA) sanding disks, while others use hook-and-loop (a.k.a. : Velcro) disks. PSA disks are less expensive, but hook-and-loop disks are much faster and easier to change and reuse. And while most random-orbit sanders have a single round pad, the newest technology has a two-part pad that consists of an outer ring and an inner round pad. The latest such model is the new Rockwell RK4248K Random-Orbit Sander (about $70), which employs dual-pad technology for fast, efficient sanding. The tool comes with a 15-piece accessory kit that includes five sets of hook-and-loop abrasive rings and discs in three different grits: 60, 120, and 180. The new Rockwell random-orbit sander has two sanding surfaces: a 5-in.-dia. outer abrasive ring, and 3-in.-dia. inner abrasive pad.